Midfrequency Induction Heated Apparatus｜Products｜Tokuden Co., Ltd. The technologies of Tokuden, a pioneer in induction heating, are changing the field of thermal processing. With induction heating in an intermediate frequency magnetic field, at which better current penetration occurs, metals are heated at a stable temperature with high accuracy, thus achieving both better production yields and high quality products. In addition, this method reduces the time before reaching the set temperature, contributing to production efficiency and energy savings. It is also safe because it uses only electricity as the heat source, thus contributing to the reduction of CO2 emissions. It also minimizes external heat radiation and provides a safer work environment. We can customize the Midfrequency Induction Heated Apparatus according to customers’ requirements, such as the shape and purpose of the heating object, production lot, and installation space. 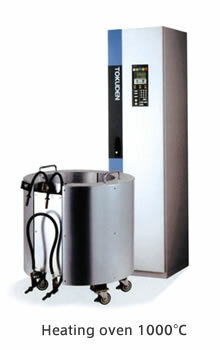 Tokuden, with its special power supply technology, can flexibly respond to a variety of customer requirements. 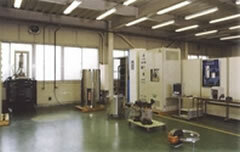 The heating coil can be made in various shapes and capacities according to the object being heated. The cooling method is also selectable from self-cooling, air-cooling, or water cooling. Capacity can be from 1 to 350 kVA, with maximum frequency up to 1000 Hz. We can respond to a wide range of requirements. The output frequency is adjustable within the specifications range. The apparatus is adaptable to various heating objects. We also fabricate matching transformers, responding to any voltage and current requirements. We can provide 3-fold (Tripler) or 9-fold frequency methods on a combination of the transformer and saturable reactor. Instead of an inverter system, the apparatus employs a stationary induction system, achieving better resistance to severe load variation and longer service life. The apparatus is free from inductive interference, which occurs in high-frequency induction heating or superficial high heating. We can also provide the apparatus at a reasonable price. You can actually test a sample. If you provide a sample heating object, we can perform a test according to your required conditions and applications, based on which we can propose the most suitable specifications.